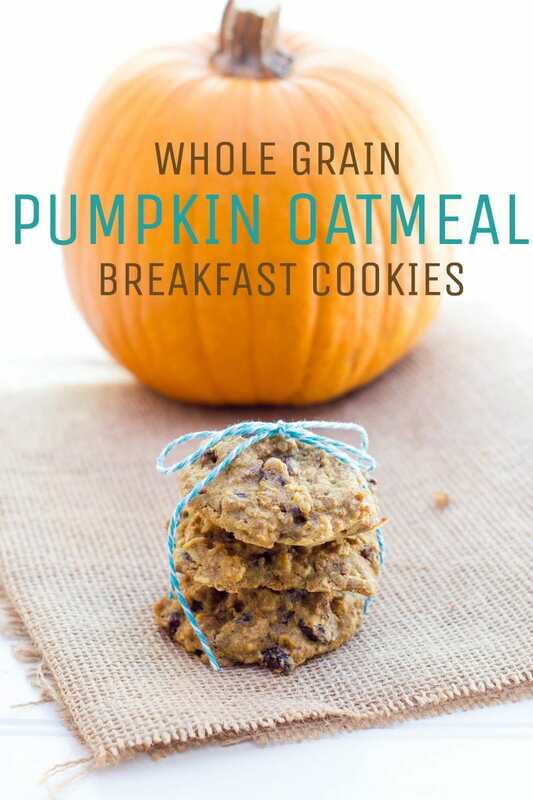 These lightly-sweet Oatmeal Pumpkin Breakfast Cookies are a grab-and-go healthy breakfast for busy weekdays. Packed with whole grains and healthy fat! We just hit fall, and it feels like we’re already in pumpkin-overload, doesn’t it? I tend not to do trendy things, and instead focus on just cooking the things I feel like cooking for funsies, but pumpkin-flavored food is one place where the masses of Pinterest and my kitchen desires align perfectly. I love, love, love pumpkin season! So please forgive me if I join in the pumpkin fun. I promise my obsession won’t last too much longer. I love pumpkin because not only is it delicious and healthy, but also because pie pumpkins are incredibly easy to grow and store. We grow our own pie pumpkins every year and store the ones that are in good shape in our basement for use all fall and winter long. The ones that aren’t quite storable get roasted, turned into puree, and frozen. Even if you don’t grow your own, I highly recommend picking up a few pie pumpkins at your farmer’s market and making your own pumpkin puree. It is so easy, and about a thousand times more flavorful than the stuff you get in the can. It is also so much cheaper to roast your own! Bonus: the pumpkins are so pretty, you can use them as decor in your house until it’s time for their trip in the oven. I’ve been really into breakfast cookies lately. They are the perfect snack for when I’m up during the middle-of-the-night with the little one. I like them so much because they’re just a little sweet—unlike a dessert cookie. Plus, you can pack them full of all kinds of healthy and nutritious foods. 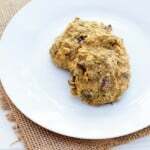 This version I packed with healthy whole grains (in the form of whole wheat flour and rolled oats) and healthy fats (in the form of eggs, flaxmeal, and coconut oil). You could throw in protein powder, chia seeds, nuts, other dried fruit—whatever tickles your fancy! I highly recommend making up a batch of these on the weekend and stashing them in the fridge to make weekday breakfasts run smoothly. 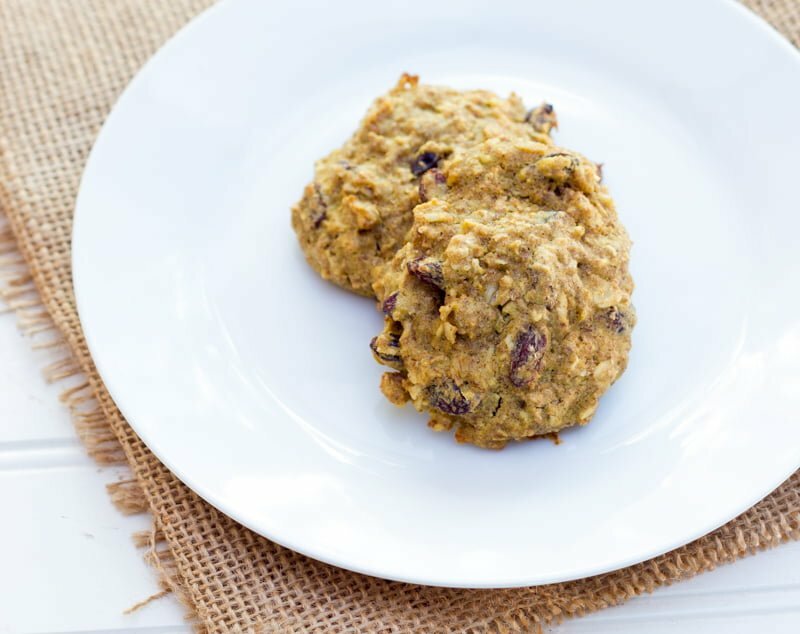 A couple of these pumpkin breakfast cookies plus a green smoothie is one heck of a healthy breakfast. And if you have family members that turn up their noses at eating healthy, you might just be able to trick them into eating something mega-nourishing by telling them you’re having cookies for breakfast! These are also perfect for afternoon pick-me-up snacks when you’re craving something sweet, but not looking forward to the sugar crash that happens if you indulge. You get a little bit of sweetness and a ton of energy. 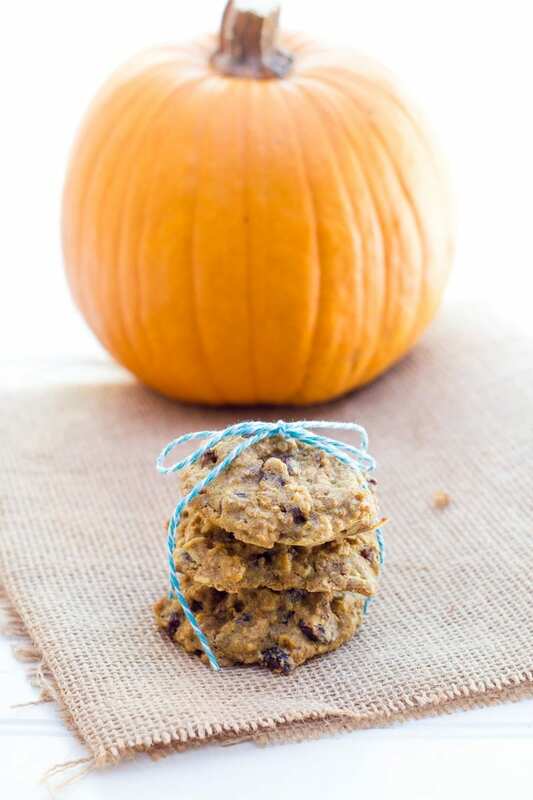 If you’re interested in making these pumpkin breakfast cookies a touch more decadent, I’d sub in semi-sweet chocolate chips for the raisins, add in a couple of handfuls of chopped walnuts, and up the maple syrup to 1/2 cup. It’ll still be a healthy cookie, but more of a healthy dessert cookie instead of a breakfast or snack. Still delicious! 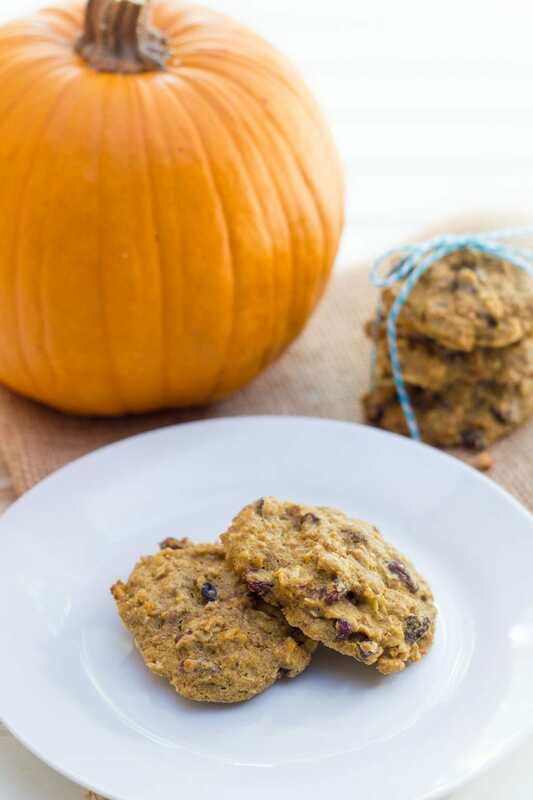 These lightly-sweet breakfast cookies are a great grab-and-go healthy breakfast for those busy fall weekday mornings. Packed with pumpkin spice flavor, healthy whole grains, and healthy fats! Preheat oven to 350°. Line a baking sheet with parchment paper, set aside. In the bowl of a mixer fitted with the paddle attachment, add in the coconut oil, eggs, vanilla, pumpkin, and maple syrup. Mix on medium until well-blended. Add in the flour, oats, flaxmeal, baking soda, cinnamon, cloves, nutmeg and salt. Mix on medium until well-blended. 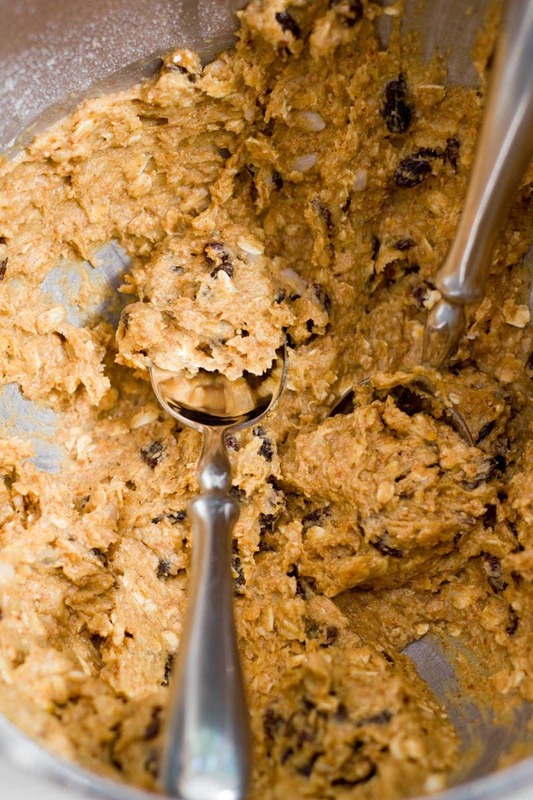 Fold in the raisins using a wooden spoon. 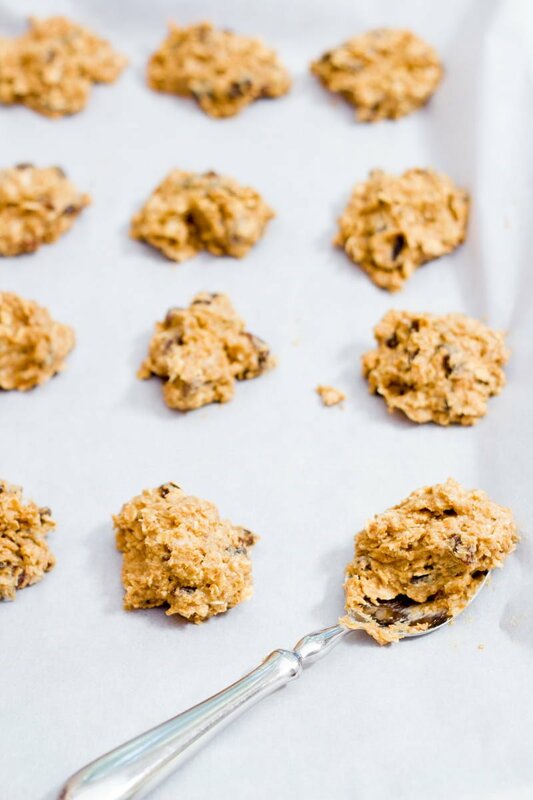 Drop rounded tablespoonfulls onto the prepared baking sheet, leaving about an inch between cookies. Bake in preheated oven for 12-15 minutes, or until golden brown and solid. Let cool for five minutes on baking sheet, then transfer to a wire baking rack to cool completely. I’m so glad you put this recipe up. I’m trying to make appealing, healthy breakfasts for my kids, and have been looking for just the right breakfast cookie recipe. This plus nuts for a little protein seems exactly right. Which nuts do you mean? Peanuts? http://happyforks.com/peanuts/all-types/4041 – it has plenty of protein, I like it. Peanuts, walnuts, pecans—whatever you like! I love pumpkin recipes. I don’t use eggs, could use more flax meal? Two flax eggs might work, but I’ve never tried it with them! Mix together one tablespoon ground flax seed with three tablespoons warm water. Let sit for about 10 minutes until it’s thick and sloppy—kinda like an egg. You can replace eggs one-for-one in most baking applications with this mixture (it works with chia seeds, too). What kind of oats? Regular or quick cook? Oh how I love breakfast cookies! These look so great! Can I sub the coconut oil with veg oil? I don’t see why not, but I’ve never tried it. Let me know how it turns out! These look so good! And if they’re not too sweet, that’s even better. I have a really hard time finding pie pumpkins here for some reason and we are not able to grow them ourselves. These look good though- how strong is the coconut flavour in them? Not strong at all—I couldn’t even taste it. Just made a batch – they are delicious! Can they be frozen? I’ve never tried breakfast cookies but I think I’ll have to try these. Though, to be honest, the dough looks so yummy I might not want to bake them. Thank for your sharing this recipe! I replaced the raisins by dried cranberries and it was delicious! Could I sub in GF flour instead of whole wheat? I’m not sure, I’ve never worked with GF flour. Let me know if you try it! Love these but they were too soft for the kids….how do I get them to be crispy? i LOVE pumpkin! these look incredible! Im drooling! Can coconut sugar be used instead of maple syrup? And would it be the same quantity? I’m not sure, I’ve never worked with coconut sugar before. It’s worth a shot! Do you think a batch would do ok being shipped in the mail? Or do they have to be refrigerated? Thank you for this recipe! My little guy (15 months old) and I made these this morning. He LOVES them, and I love that I he’s eating “cookies” that are good for him. Can’t wait to check out your other recipes! Hi! I don’t have flax seeds or flax meal – how will this change the recipe? Will it still turn out okay? Not sure! I’ve never made it without them. Let me know if you try it! My breastfeeding group was talking about how flax and oats can help with supply. Made these today with that in mind (and used canola oil instead of the coconut oil, worked fine!) These are delicious, and perfect for us nursing mamas! Thanks! Coconut oil is NOT a healthy oil. You’re better off using veg oil instead. You are free to sub in whatever fat or oil works best for your diet. Butter, vegetable oil, ghee, or even lard would be fine. Really? I keep hearing how good it is for you! Please elaborate on why you say it’s bad! Thanks! I cannot wait to make these with my preschool class!